This is the first in my Stories from the Healing Table series. 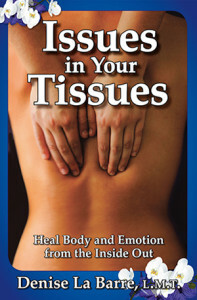 It was first published in my book Issues in Your Tissues: Heal Body and Emotion from the Inside Out. 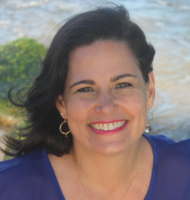 The story what an intuitive approach to unbuckling emotional armor looks like. It also illustrates that we all have unshed tears and need for emotional release. I often tell it in a private session to illustrate that it is normal to carry stuck emotional energy and that the release can be quick and easy. 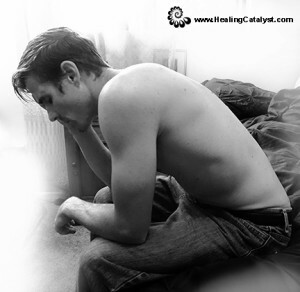 I also tell it when I feel a person so emotionally pent-up, he simply needs a good cry as a first healing step. One day a strapping 34-year-old by the name of Patrick came to see me for a massage. His new wife had insisted he get a massage, knowing he could use some bodywork after a hectic wedding. He had had one or two massages before, and no recent surgeries or other health concerns. “That’s when my parents got divorced,” he said. Aha, I thought, that’s it. I felt an extra surge of energy in my body–confirmation. “So you never had a chance to cry?” I said. The massage continued as I pushed on the energetic knots in his muscles and tried to ease them into letting go of the emotional load they carried. I was looking for an opening in his subconscious will. When someone’s will is fixed on holding in emotional pain–for whatever reason–I’ve found that physical pressure alone cannot force the muscles to release the tension pattern. Patrick’s mind wasn’t allowing his muscles to let go but he had no conscious awareness of how to do it. He needed to open his inner door for himself and I intuitively searched for words that would knock in just the right way. “Divorce is a raw deal for everyone, but especially for the kids,” I said. “Kids blame themselves for the breakup. As if you were somehow better, your parents would have stayed together. Talk about ripping your whole world apart…” I felt compassion for the boy in pain and kept working. Within a few minutes, he started to cry. Powerful, heartfelt sobs shook out in waves. These tears were eighteen years overdue. He eventually soaked the covering of the face cradle. I kept quiet and let the energy pass on through. When he turned over so I could work on his frontal side, I noticed that his face looked raw and new, like a bud emerging from a husk. People often look like they’ve just awakened from sleep when they come out of the face cradle but this was more dramatic than that. He wasn’t self-conscious, just busy integrating the experience. I kept thinking about the latest version of Disney’s “The Parent Trap” and suggested he rent a copy. (It is about divorce/familial separation from the child’s perspective, and it always makes me cry even though my parents are still married.) He said it was “funny that I should mention it,” as he had been about to rent it the week before. I figured he had more divorce-related feelings to work through –anger, fear, sadness–and tears to shed. Seeing the movie might bring up different issues and help him release more of those overdue tears. When he got up from the massage table he looked as if the weight of the world had been lifted from his shoulders. His body had been ready to let go of it, even though his conscious mind wasn’t aware of it. It was the combination of talk and understanding, intention, and intuition that made it happen. I never heard whether he rented “The Parent Trap.” But I do know that helping him feel the connection between his tight shoulders and those unshed tears was the most profound thing I could have done for him that day. I tell this story a lot. Even a diehard skeptic will acknowledge the relief of crying out pent-up sadness and grief. Telling a similar story creates an opening. It serves as a roadmap into emotional territory where a person may never have ventured before. Then too, the way I tell it lets people know that not only am I not going to judge them for their reactions, I’m going to encourage them to breathe – maybe even have a good cry like the guy in the story. In fact, in the next week’s story, Patrick’s tears helped catalyze a release for Carrie. His story showed her how it could be done and gave her permission to let down her own defenses.